1. 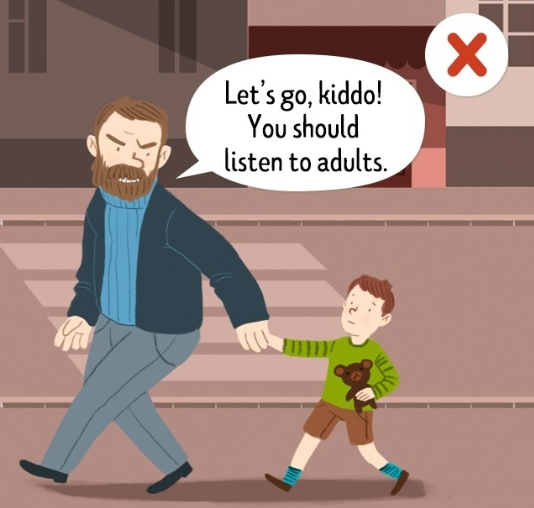 "You should listen to adults." Hearing this, the child thinks: "All adults are smart and good. I have to do as they say." 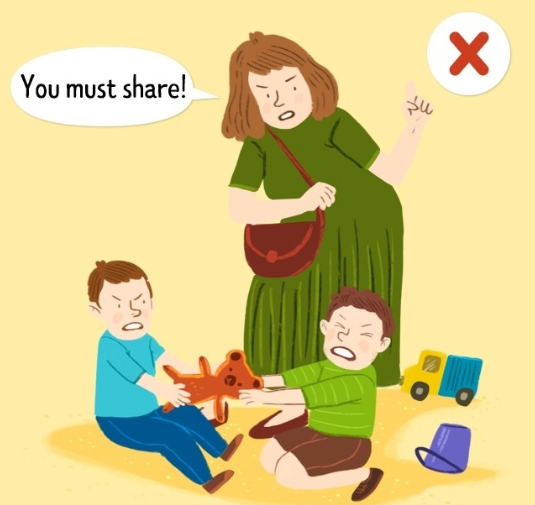 This phrase is dangerous because the child starts to trust all adults, including strangers, and does not expect anything bad from them. 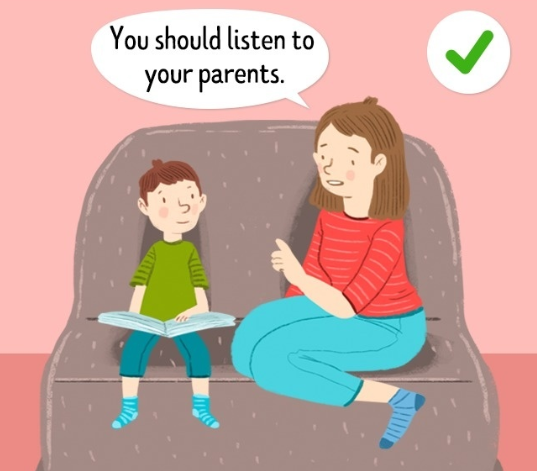 The correct phrase: "You need to listen to your parents." This helps the child develop critical thinking and a healthy distrust of strangers. Hearing this, the child thinks: "It’s bad to show emotions. I’ll just be scolded for tears." He may grow up silent and withdrawn. Latent emotions will sooner or later manifest in aggression or tears. The correct phrase: "Tell me what’s bothering you." "Why are you crying?" 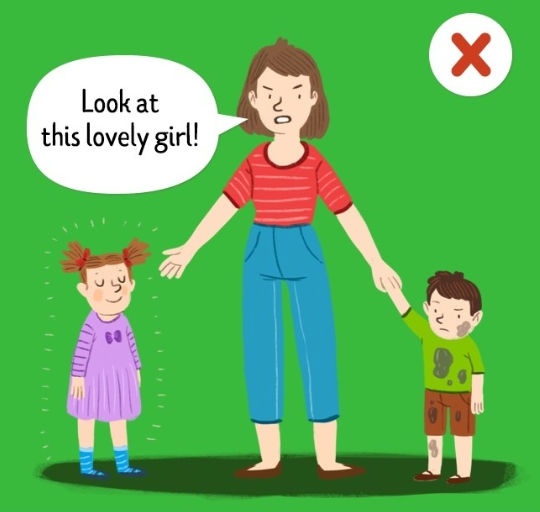 If the child falls or gets bruised, try "Are you crying because it hurts or you’re frightened?" This will provoke a conversation which will help the child identify their emotions. Hearing this, the child thinks: "I must share everything. There is nothing that’s mine." Over time, these thoughts will develop into sacrificial behavior. He will not protect his own values and possessions, thinking he isn’t worthy of them. The correct phrase: "Would you let this boy play with your toy a little?" "Maybe you want to exchange toys for a while?" 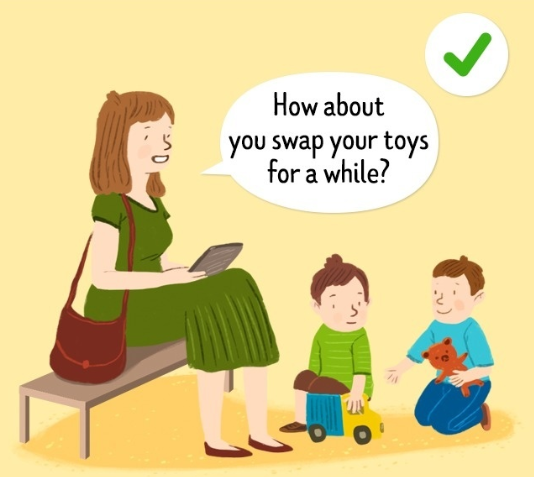 Give your child an opportunity to manage their things themselves. If he is against sharing, then do not insist. 4. "Look at this lovely girl." Hearing this, the child thinks: "I am worse than others. It makes no sense to try anything. It won’t work." Comparing him with others negatively affects the child’s self-esteem, making him think he will never achieve anything. The correct phrase: "I love you. You can do this too." 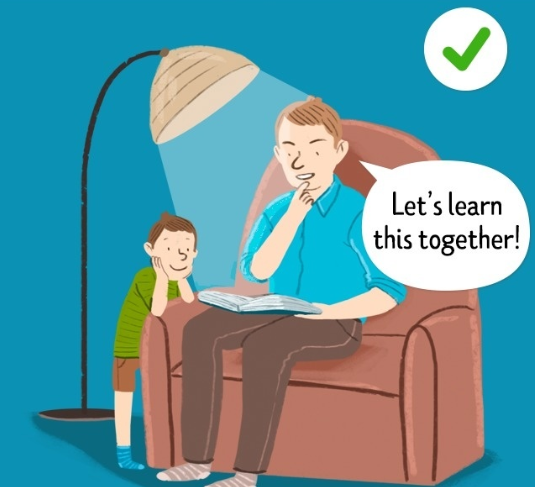 Point out your child’s abilities, and show that you believe in him. Remember, your child is unique and has his own talents. Hearing this, the child thinks: "My parents don’t know I came up with this." Such a child will think that he can go unpunished, having pushed the blame onto others. The correct phrase: "Why did you do that?" 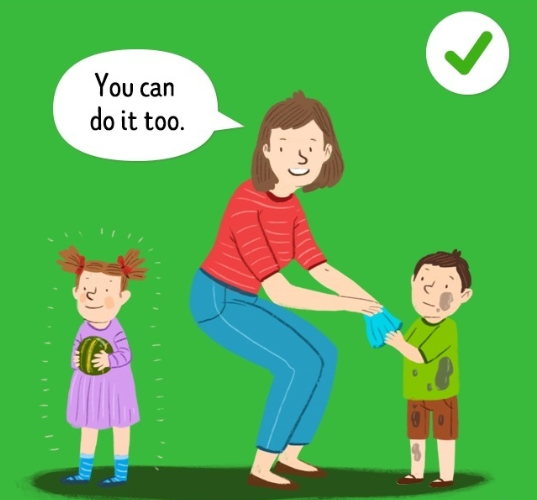 This will help you find out whether the child did it himself or upon someone’s encouragement. Give him the opportunity to explain his actions. 6. "You’re too young to think about this." Hearing this, the child thinks: “I want to know. 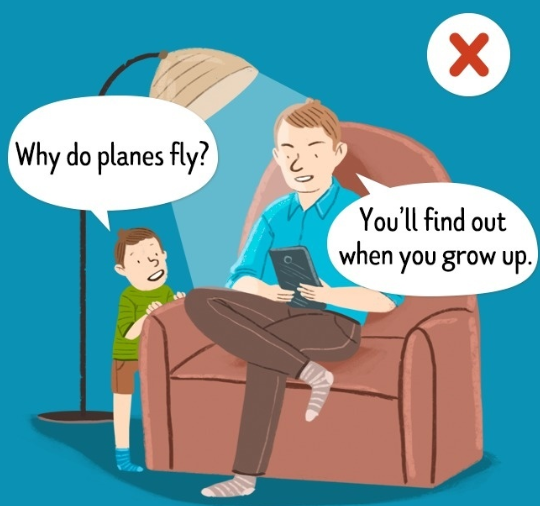 I’ll ask someone else!“ If your child asks you uncomfortable questions but does not receive information, he will receive it from other sources — much less competent ones. The correct phrase: ”I’m not ready to answer now. I need some time." Do not dismiss the child. If he asks you a question, try to answer it. This way you will remain an authority in his eyes and won’t lose his trust. 7. "We’ll talk at home." Hearing this, the child thinks: "My parents might hurt me. They don’t like me. I don’t want to go home." The parents are no longer loving but threatening, and the house becomes a place where the child expects punishment. The correct phrase: "Let me tell you what upset me." Hearing your point of view, the child will learn to take your feelings into account when pondering his future actions.